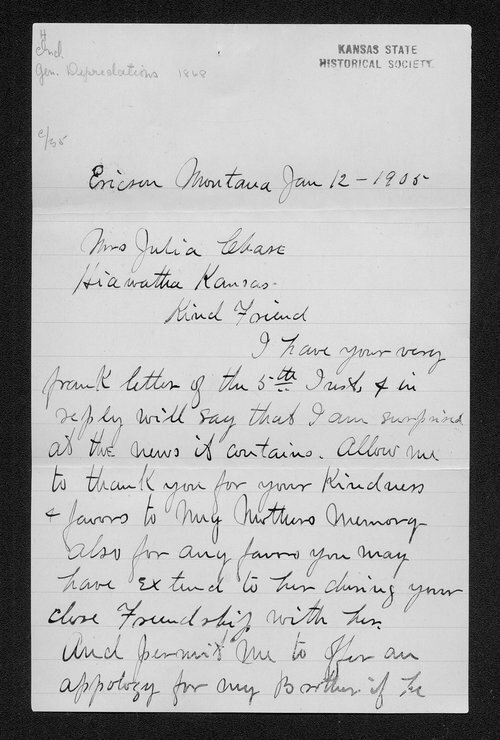 These items contain correspondence between Hiram Bickerdyke (son of Mary Ann "Mother" Bickerdyke), Julia A. Chase (author of "The Straight of It"), and George Washington Martin (Secretary of the Kansas State Historical Society). The primary concern of the letters is to correct the deficiencies Bickerdyke found in Chase's article on Indian raids near Salina, Kansas, in 1868. People - Notable Kansans - Chase, Julia A.